Gutters, not something I ever think about, or want to think about until it causes a problem. Situations like clogging and overflowing or gutters being ripped down by ice and snow certainly get my attention. How about when gutters ruin a perfectly mulched bed after a torrential rainfall because the downspouts have become separated from the home? We could avoid these situations by paying closer attention to our gutters and not waiting until problems arise. Maybe gutters need a simple cleaning, or maybe they need to be replaced altogether. This could be a simple DIY job, with sections of gutters being sold at Home Supply Stores HERE, or maybe hiring a professional is a better option if the home is more than one story tall. If there are a lot of trees towering over a home, periodic gutter cleaning is necessary. Pine needles are a big cause of gutter clogging. Adding gutter guards may be a good option to consider for homes in wooded areas. That depends on the maintenance and installation of the gutters. Of course the material of the gutter will also determine longevity. Our gutters are fairly new, having been replaced within the last 4 years and appear to be aluminum. But even with new gutters, if not properly maintained, problems will arise. We have a variety of different issues with the gutters around our home. In this area, off the mudroom, a bottom connector fell off during a heavy rain fall. Why?Because it is filled with pounds of nesting material from birds, and the weight of the rain and the debris caused the separation. In this area of the home, the gutter ripped and became separated from the downspout due to the weight of ice and snow sliding off the roof. This situation was caused by the downspout becoming separated from the bracket, therefore the water could not drain properly and was ruining the landscape. Another situation of a broken gutter due to winter weather. As you can see, the snow guards on the roof are bent downward due to the weight of ice and snow. In prior homes, we never had the need for gutter repair work, and we did not regularly maintain our gutters. Looking back, I realize that may have been a mistake, but the homes were fairly new and not surrounded by trees. When I started looking around for a professional, I didn’t have a good reference for whom to contact. I ended up calling one of the large gutter companies to come out for an estimate to do repair work. They came out and spent 30-45 minutes with me walking around the home and describing what they saw. They said they would get back to me in a week with an estimate. I never heard from them again. When a company doesn’t respond with an estimate…that speaks volumes about the company. I wasn’t about to go chase them down, there are plenty of others companies willing and able to do the work. I do have an exception to the rule. If a company has earned my trust and has performed good work in the past, but is lax about getting an estimate for additional jobs, I will cut them slack and track them down. But if we have not developed a rapport, they are dead to me and will not get a recommendation. One of the best ways to hire reliable companies to do work on your home is by referral. Talk to your friends and neighbors, ask them who they use and if they are happy with the work performed. A friend of mine, recommended a local gutter handyman who had recently replaced gutters on their home. She was very happy with the work and recommended him. I gave him a call, he came out, gave me an estimate on the spot and performed the work the same day. And he did a fantastic job!! Remember that plastic extender that was filled with bird nest debris? A new extender piece was attached and added to the drain. A new section of gutter has been attached to the front of the home to replace a torn one. A new bracket has been attached to the existing downspout and an extender added to the bottom that attaches to the drain piece. The torn gutters, in the back of the house, have been replaced by new ones, and damaged snow guards have been replaced as well. We are very happy with the gutter repair work done to our home. 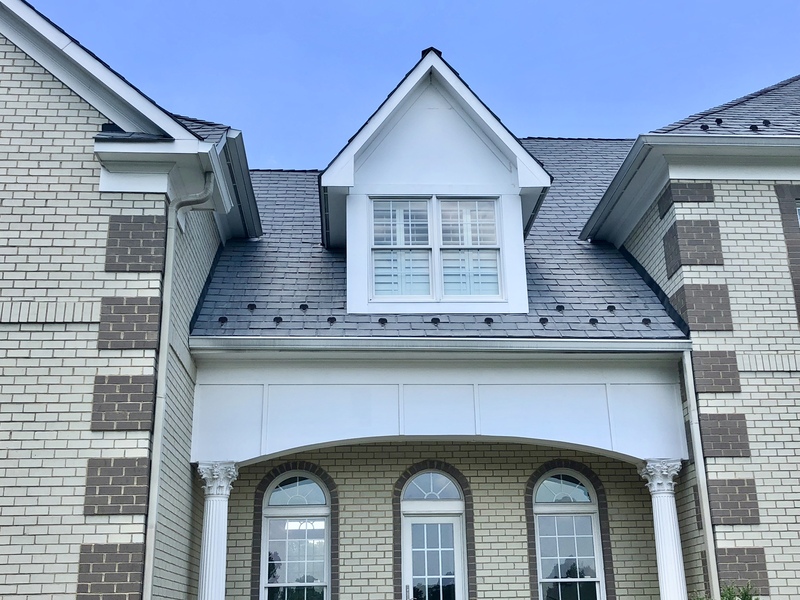 As I have talked about prior posts, we are getting ready to embark on an extensive landscaping job, so having properly functioning downspouts is important to the landscape aesthetics. Do you regularly maintain your gutters, I’d love to hear from you. For more informative posts about outdoors and gardening, subscribe to Happy Haute Home and follow along on Pintrest HERE, and Twitter HERE and feel free to pin and tweet your favorite pics from Happy Haute Home.